In early 1986, I was still sleeping in Databir's living room right next to a one hundred pound dumbbell on the floor. One day the previous fall, Databir had excitedly told me that Guru had lifted a one hundred pound dumbbell over his head. Inspired, I picked up the dumbbell on the floor. It was heavy, but back in my school days I had lifted free weights regularly. With some strain, I hoisted the dumbbell overhead with one arm. Databir was genuinely excited. "Wow," Databir exclaimed, "that's great Yogaloy!" Within a day, however, Databir's mood was more subdued. 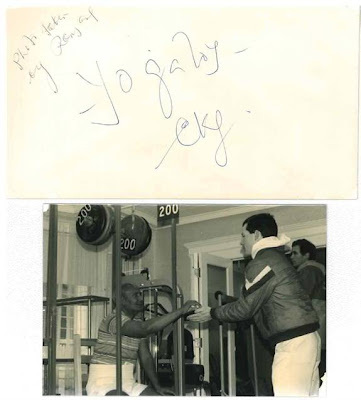 "Yogaloy," Databir said, "I told Guru about your lift. He said that he doesn't want you to lift more than 60 pounds because it might damage your subtle nerves." I was a bit taken aback. In retrospect, I don't think Guru meant it as a rebuke, but that's how I took it at the time. I had no intention of going back to lifting weights -- since becoming a disciple, through hard work, I had become a runner. The only reason I'd lifted the dumbbell in Databir's living room was because I had been inspired by what Guru had done. So, I felt a little down after talking to Databir the previous fall. All was forgotten by March 1986. It was still cold in New York and for a few weeks Guru had been inviting disciples to meditate outside his house each morning for a few minutes, after which there'd be prasad. One morning that month, however, Guru made a special announcement: that morning he had pressed a 200 pound dumbbell overhead with one arm. He then asked those of us congregated in the street outside to come in for prasad. As we filed by, Guru sat beneath the rack which was cradling the 200 pound dumbbell. He personally handed the blessed food to each of us. Ranjana, who I hadn't previously seen use a camera, snapped the photo above, put it into an envelope and had Guru sign it for me -- very thoughtful of her. Later that day, we got word at the Smile that there was going to be a 200 mile road race to celebrate Guru's lift. The race would be open to all disciples and would be run on a one mile loop within Flushing Meadows Park. There would be a four-day cutoff. Sahishnu promptly announced that the Smile would close that week as he (an accomplished ultra-distance race walker), Satyajit, and I (among perhaps 30 other disciples) planned on competing.